We have broadened and deepened our engagement with the government and social agencies on the issue of food safety. As a responsible corporate, we aim to integrate sustainable practices into our core business strategy. If the world today is moving, slowly but consistently, towards conscious and responsible action, it's because of one simple idea: everyone can be a change-maker. It's a precept Marico has believed in for years. In every layer of our organization, and in the DNA of every member, is embedded a desire to make a difference; to adopt every possible measure, big or small, that will take us further along the road to sustainability. We can, and we do make a difference. We see it not only in bottom lines and awards, but also in enhanced relationships, a safer, cleaner environment and a corporate ethos that has sustainability embedded in its very core. Climate change, sustainable development and ecological consciousness are global concerns, inspiring significant policy decisions by world leaders as well as the United Nations. As a responsible corporate, Marico is committed to the global agenda with a specific and focused framework for achieving them within the parameters of our business operations. Engaging with our diverse stakeholders in an on-going, long-term dialogue is a core component of our business. We firmly believe that a genuine and consistent stakeholder engagement initiative, offers multiple benefits in terms of collaboration and long-term growth, and has a significant positive impact on our business and sustainability goals. Marico sustainability objective is therefore, focused to create industry-leading value with brands and products that consumers prefer, while at the same time, conserving resources, protecting the environment, and improving social conditions for those who need it most. We have targeted six material areas which are very critical to our business in today's context. As Marico's material and service requirements are varied, sustainable procurement becomes critical for the business. We aim to procure goods which are economically viable and which benefit the organization, customers, society and the environment. As a responsible corporate, we aim to reduce our energy consumption and adopt environmental-friendly production technologies. Availability of water is a global challenge today and as a part of our ongoing sustainability commitment we aim to set new benchmarks in this material area of our business. Waste management is an area of high relevance to our business and we are committed to reducing our waste on a year-on-year basis and having a robust waste recycling and reusing mechanism in place. The products we manufacture are used by people every day, and our consumers expect our products to be environmentally and socially responsive. Therefore, we aim to provide products that are safe in nature and do not impact the environment and community adversely while maintaining high quality standards. Building competencies is a progressive process; in a dynamic environment it becomes critical to build future-ready capabilities for business and individual growth. Sustainable supply assurance is at the heart of Marico's Procurement Excellence Framework. As a part of our business initiatives, we have been able to forge a strong and long-lasting relationship with our partners. Majority of Marico's raw materials are agricultural produce. Our "Farmer First" programme was launched a few years ago, with the aim of solving immediate issues and empowering farmers for the future. The initiative has helped the farmers to strengthen agricultural productivity and multiply yields on a sustainable basis. We constantly engage with coconut farmers and train them on agricultural management. Marico is proud to have conducted over 150 sessions, training more than 4500 farmers, and enrolling more than 500 farmers for a scientific implementation of practices. As a responsible stakeholder in the safflower value chain, Marico stepped in to help, with its Safflower Extension Programme. The plan was multi-faceted, aimed at improving various aspects of the value chain. Green Manufacturing is the vision that is at the heart of our environmental stewardship - a holistic approach that encompasses energy efficiency, reduced water consumption, waste management, renewable energy and greener manufacturing processes and technologies. Every member of Marico is imbued with the spirit of sustainability and the genuine desire to protect and preserve nature. 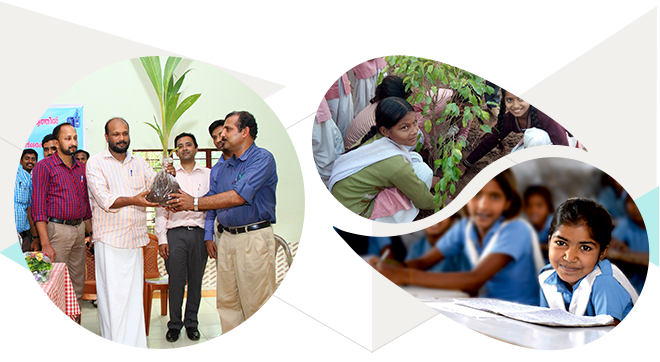 Marico's csr vision is anchored in its core purpose, i.e. to "make a difference" to the lives off all its stakeholders to help them achieve their full potential. At Marico, the idea of social responsibility is viewed from the perspective of moral and ethical duty rather than an obligation. We explore our commitment to 'Make a difference' across the spectrum, from initiatives that enhance lives in our immediate neighbourhoods, to ambitious programs that propel business growth and impact the economy. Incepted in 2003, Marico Innovation Foundation (MIF) is a not-for-profit organization in India executing the Corporate Social Responsibility for the parent company Marico Limited. Through its sector agnostic programs, the foundation works towards nurturing innovations that have the potential to bring change and add immense value to overall growth of the nation. MIF�s Scale-up program aims to help young �innovative� organisations in accelerating their growth through what we call �deep rooted and intensive mentoring� from a domain expert. The mentors devote their time and experience in developing an implementable course of action and this entire process is monitored by us through pre-determined milestones. The engagement ends when the challenge is resolved and the organization is ready to scale up operations seamlessly. Started in the year 2006, this is a biennial platform that identi?es and awards innovations that hold potential to generate large scale impact. Over the previous editions, MIF has recognized more than 50 innovations across all categories. The eclectic jury has the knack to handpick the next big innovations in India, making MIF Awards a pioneer in recognizing unheralded innovations. A recognition platform in the form of an online video series. This is a series of short online videos that showcase impactful innovations with an aim to increase their exposure. It has proven to amplify awareness resulting in tangible bene?ts for innovations. Committed to creating a culture of innovation in India, highlights of the journey of successful innovations and innovators form the crux of Innowin. Over the course of time, the content of Innowin has evolved from the conventional magazine that it used to be, to MIF�s weekly online newsletter. Marico has created a CSR culture which empowers its members to actively give back to society in simple yet impactful ways. Members at different locations of Marico come together to support big and small causes. As part of our continued efforts to create a positive lasting impact on the society, Marico Bangladesh formed a partnership with Dhaka Ahsania Mission (DAM) to bring the light of education to underprivileged communities. With 75 centres offering education, life and social skills, the Center has enrolled 3113 children, mainstreamed 863 children in formal schools and also created awareness of child rights and the social evils of child marriage and dowry. Our brand Just for Baby launched an initiative in partnership with Childline South Africa, an effective non-profit organization that works to protect children from violence and create a culture of children's rights in South Africa. Marico South Africa launched the HERCULES Smart School Campaign in 2015. HERCULES reached out to 50 schools in 2 townships within major metropolitan areas. The campaign was a success resulting in HERCULES interacting with over 32,000 learners (plus the teachers and parents) over the set period.